For information on my affordable online design service, click here. 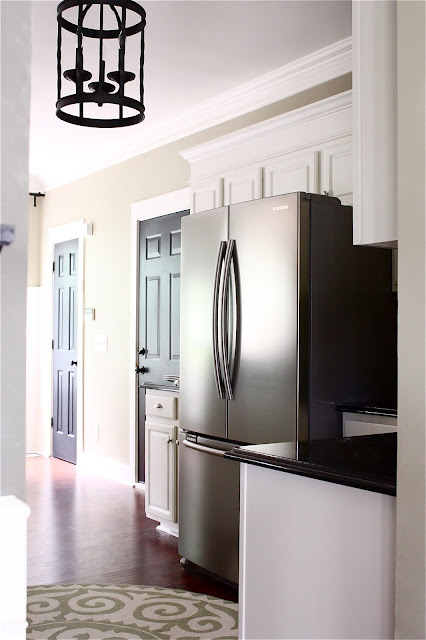 Today, we are going back in time a bit to revisit my recent kitchen makeover. Due to a recent pin-gone-viral, I've received many emails requesting sources of elements in the new space. Before I share, let's take a look at the project. You may remember when I began the makeover. It started with a grand vision of the "perfect kitchen". The "perfect kitchen" design plan quickly exceeded our budget. Once I gave myself a reality check, I focused on making the space "better" instead of "perfect". Wall Color, "Coir" by Martha Stewart. Coir has since been discontinued. Martha's "Heath" is very similar. 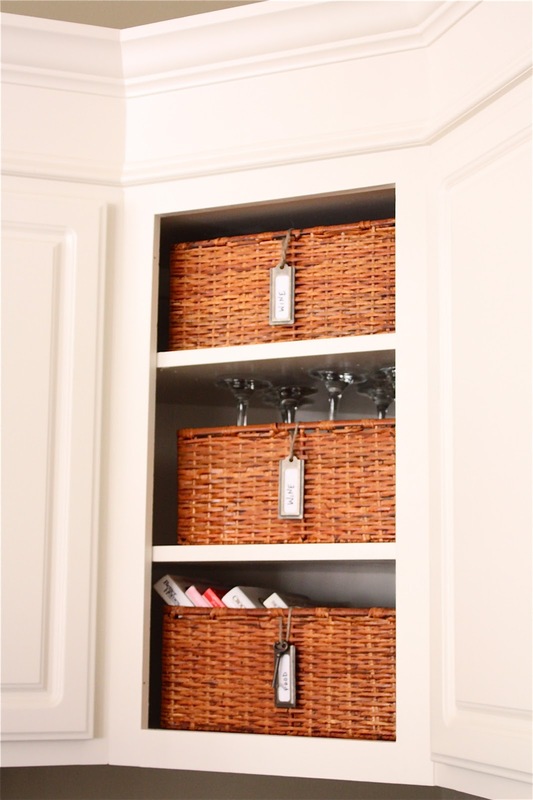 For a complete post dedicated to our cabinet makeover, click here. 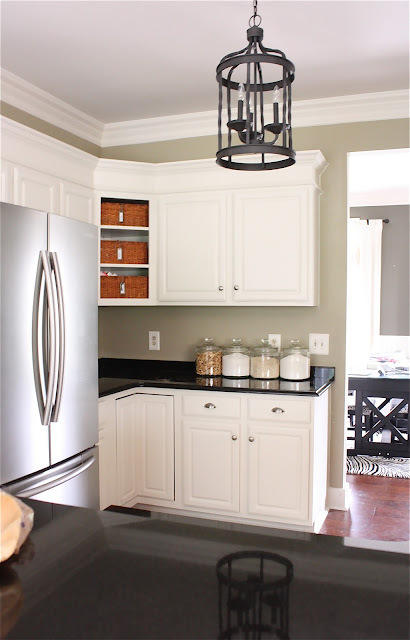 Our cabinets were painted by a local professional cabinet painter and the moldings were added by a local carpenter. The cabinet paint color, "Tailors Chalk" by Martha Stewart. 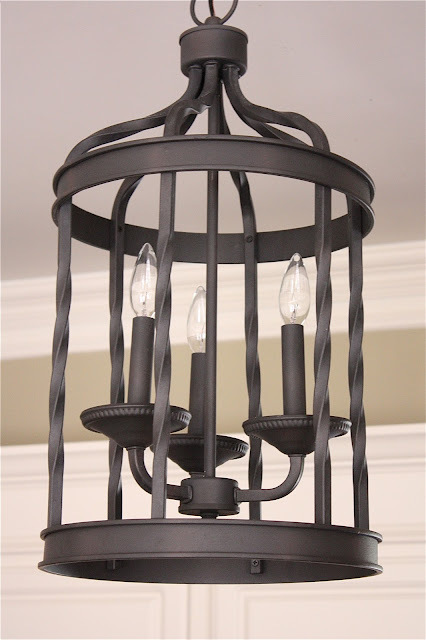 Three light lantern, The Home Depot. 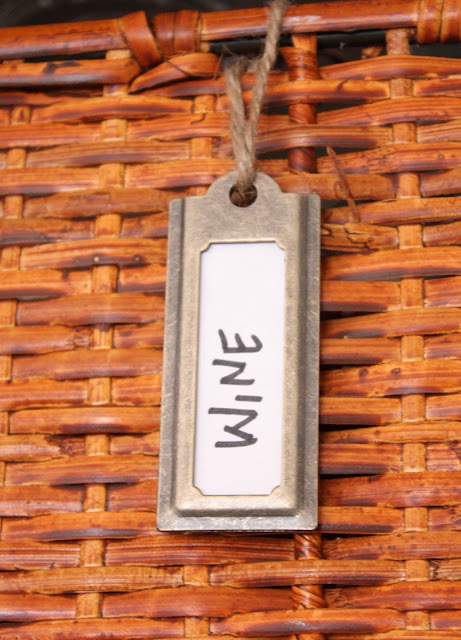 Wine Storage/Cook book baskets and labels, from Ballard Designs. A real wine fridge was part of the "perfect kitchen" design plan. This is the "better kitchen's" version. For the tutorial post on this project, click here. Dining table and chairs, Crate and Barrel. Chandelier, The Home Depot (with custom shades). 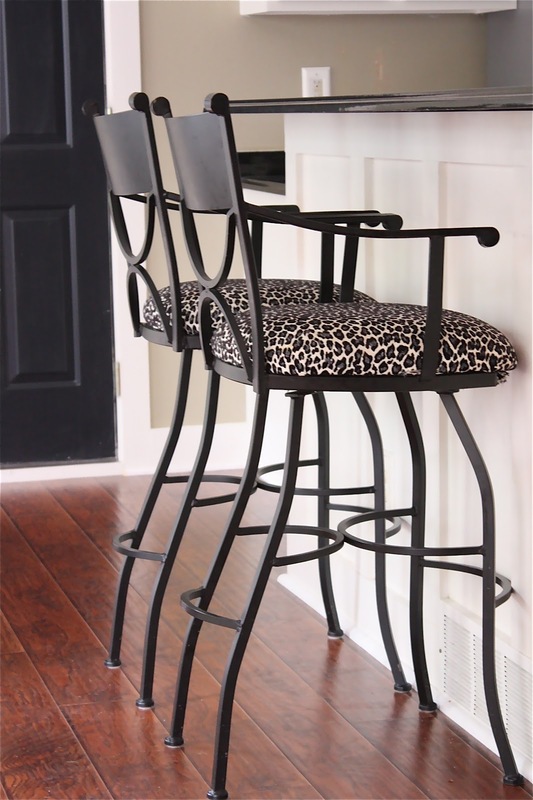 Bar stools, The Great Indoors. Bar stool fabric, Hobby Lobby. Cabinet hardware, The Home Depot. Super Thick Crown Molding Trick, details can be found here. Interior Black Doors, can be read about here. 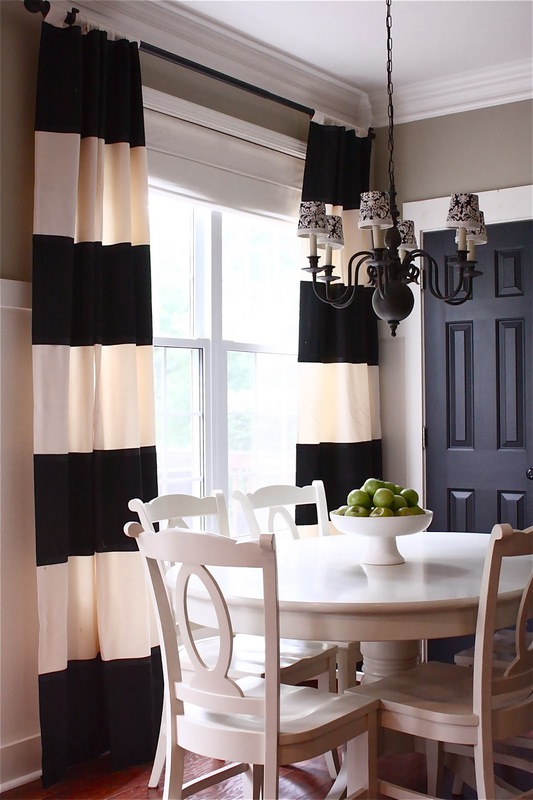 Drapes, DIYStriped Drapes Tutorial. (Or, email theyellowcapecod@yahoo.com for information on how to purchase fully lined, meticulously sewn version of these striped drapes). Our kitchen makeover has made an appearance in this month's edition of Ladera Ranch Magazine. Ladera Ranch is an Orange County lifestyle publication. I have had the incredible opportunity to contribute to this beautiful magazine during the past year. 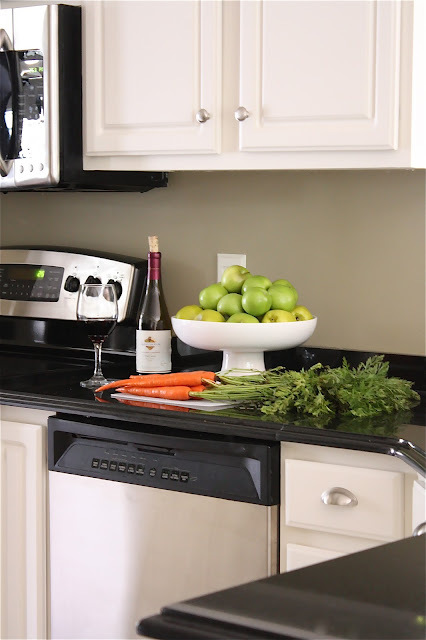 If you would like to get started on a kitchen makeover, click here for information on my affordable online design service. I love a good kitchen project! Your kitchen is gorgeous! Such a huge change painting your cabinets. 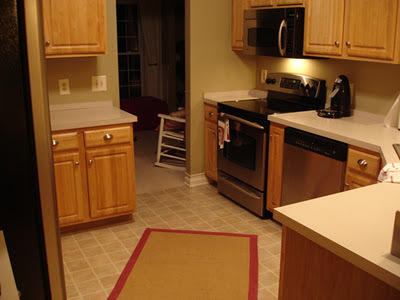 Your cabinets look like mine, except my builder didn't give us the raised panel cabinet doors. Ours have the thin inset and sound tinny when they close. I am holding out for new cabinets. The laminate on the bottom doesn't even go to the edge of the cabinet facings. I am patiently waiting. I want something different than oak and would love to stagger the heights of them, with a corner cabinet (like where your wine storage is) and a lazy susan in the one below. Those corners are a pain to get things in and out of in mine. Stunning...looks simple, crisp & functional. I would love to cook & eat in that space. I love this space! 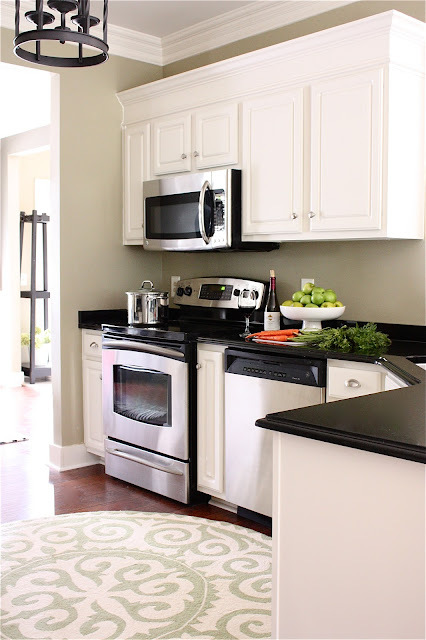 The wall color, counter tops, white cabinets...it looks elegant & sophisticated, but functional, too. Hi Sarah, everything about it looks perfect!!!!! Beautifully done as always! 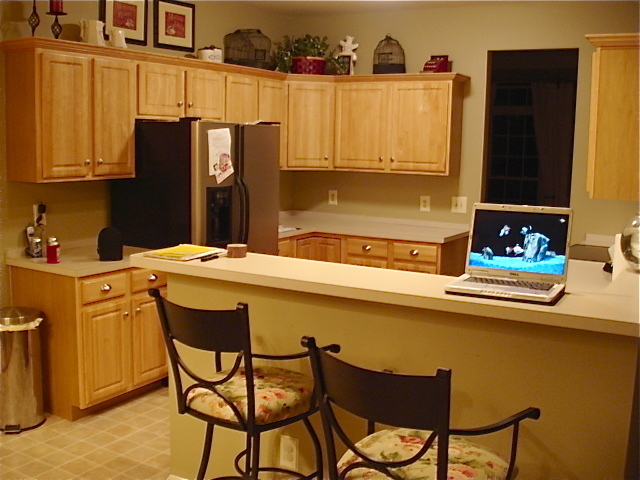 Hi Sarah, your kitchen turned out fabulous! so many people don't get "better" cause they're focused on "perfect". Your "better" looks pretty "perfect" to me!! Love your re-do! Do you have any recommendations for how to find a local professional cabinet painter? We had our oak cabinets painted by a professional painting company but I'm not thrilled with the results. I'd love to find someone with more cabinet expertise. Thanks! Amazing makeover!!! Love all the black and white! LOVE IT!!! It looks amazing! Just one question. We have a very similar back door...where did you find your shade for that? Currently we just have a cheap bamboo shade. But I really like the idea of white. Thanks! This kitchen is beautiful! 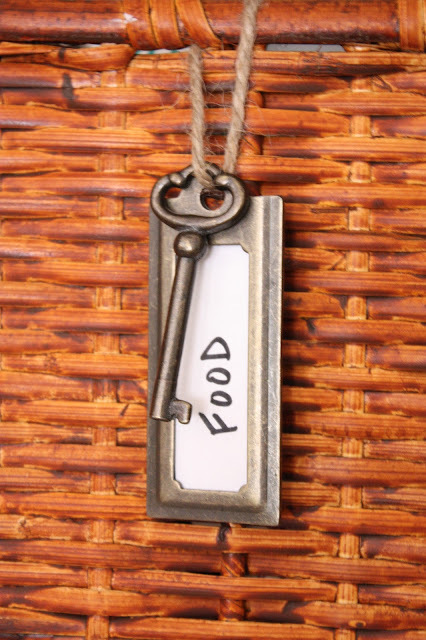 It is almost exactly what I am looking for in my kitchen reno-minus a few small details. This is very inspiring!!! I love the simplicity and functionality! Beautiful!